Apple is planning to introduce a new Apple TV set-top box in April according to Bloomberg, but the report says Apple would not begin selling the box for months. 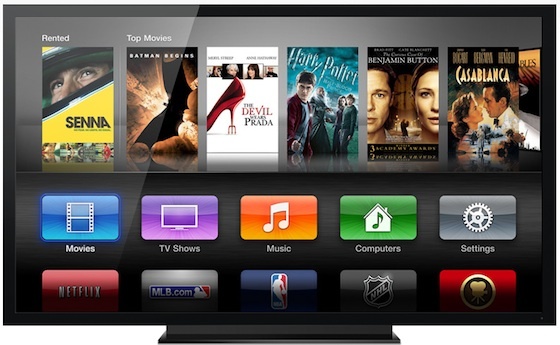 Apple is also in talks with content providers including Time Warner Cable to provide TV shows and other media. The new box is said to include an upgraded processor and a revamped interface. The current Apple TV UI is getting a bit unwieldy as the company has continued to add new content channels over the past year. Time Warner has been in talks with Apple for well over a year and the company has said it would be willing to give control of the customer-facing user interface over to Apple. Bloomberg reported last July that Apple and Time Warner were close to a deal. Apple is aiming to have the device available for sale by the Christmas holidays, though the release date could change because the company is still in the process of securing new agreements with programming and distribution partners, said two people, who asked not to be identified because the plans are private. Earlier this week, a reference to new Apple TV hardware was discovered in a recent release of iOS 7 and rumors have suggested that a new Apple TV could see added support for apps and Bluetooth game controllers in the next few months. At the end of January, the Apple TV received new prominence on the Apple Online Store, suggesting the platform could be developing into more than just a "hobby". The long delay between the introduction of the new Apple TV box and its public launch would be unusual for Apple, which prefers to announce and release products in a short time period. Apple has only had long lead times between announcement and release for major new product releases -- the iPhone debuted six months before it's public launch owing to the unique FCC permitting process for new cell phones, and the iPad was presented more than two months before it first went on sale. The new Mac Pro was previewed six months before its final release as well. It's possible that Apple will introduce a new App Store platform for the Apple TV, with the delay giving developers time to build new apps for the device. please stop announcing products months before shipment. its just annoying. I don't mean to sound rude, but why do you come on MacRumors? This site mostly focuses on news and rumors of future products that are not confirmed by Apple. I'm surprised Apple hasn't just bought Netflix, and improved from there. Announcing in April for a "Holiday" (end of year) release?!? Something sounds fishy to me. I don't want it to be essentially an Apple branded cable box. I cut the cord a long time ago. I want a better UI and lower latency Airplay. As for deals with content providers, just give me lower priced season passes and maybe add supported subscriptions and I will be more then satisfied. Interesting. It seems that Comcast is buying Time Warner. I wonder how this shakes things up?